According to Evans and Bellamy’s book of the same name, when asked what could be inferred about the creator from His works, the British scientist Haldane allegedly replied “an inordinate fondness for beetles”. Whether he actually said this or not is disputed, for a start he was an atheist, but you can’t argue with the numbers. Over 350,000 species of beetle have been described since 1758, that’s more than 4 per day. I’m pretty fond of them too, even little red devils like the one pictured above. Resplendent in black uniform and grenadier coat Liloceris lilii more commonly known as the Scarlet Lily Beetle is nonetheless a serious pest of lilies and fritillaries, eating its way through the stems, leaves and flowers. Mine have been totally devastated this year. This alien invader from ‘somewhere in the Mediterranean’ was accidentally introduced to England in 1939 and although primarily found in the south, it is now endearing itself to gardeners as far north as Scotland. 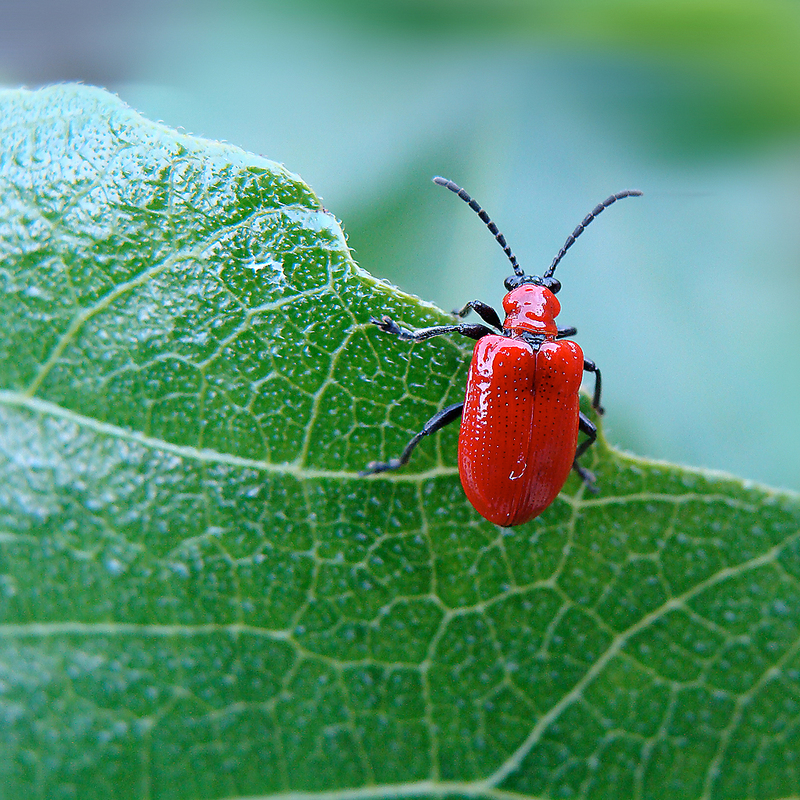 They could I guess be confused with the longer, slimmer Cardinal beetles, but the Scarlet Lily Beetle is shorter, rounder and altogether shinier with tiny dimples in its wing cases. Cardinal Beetles also have comb-like antennae, whereas as you can see this little chaps are straight and made up of 11 segments. Go on, count them, you know I have. If you try picking one up it will drop through the foliage and land on its back, its black legs and underbody essentially hiding its scarlet wing cases giving the illusion it has disappeared. However, if you are successful in grabbing one it has a surprise for you, it can squeek? It has a sound organ between its abdomen and elytra which it rubs together when distressed to make a high-pitched, rather bird-like noise. Called stridulation it is thought it may momentarily shock a predator into dropping it. Well it certainly took me by surprise the first time I heard it. It sounded like Rob Bryden doing his tiny voice. I thought I was hearing things. The orange larvae are little charmers too. They camouflage themselves from predators by covering themselves in their own frass (posh word for poo) to resemble bird droppings. Yuk.